In 1975, at the age of 16, Gary started a three year apprenticeship with a small woodturning company in Chesham called Joseph Reynolds. After 18 months was put on piece work turning mainly peppermills and kitchen ware. This experience was to help enormously when he became self-employed in 1987. However, prior to this was a 10 year period with another woodturning firm turning stair balusters and chair parts. It was at this point that Gary became involved with Stewart Linford of High Wycombe who makes the famous Windsor Chair and exports world-wide.It is since becoming self-employed that Gary has made his mark on the woodturning scene, with success in competitions, articles of his work in various woodworking magazines, and demonstrating for trade companies. One of these being Racal, where Gary demonstrated their respirator for several years and was involved heavily in its promotion at woodworking exhibitions. Exhibitions include the National Exhibition Centre Birmingham, Wembley, Axminster in Devon as well as woodturning clubs all over Great Britain, Belgium, France, Channel Islands, Ireland, Norway and two Utah Symposiums in Provo, Salt Lake City and Iceland. Gary has also demonstrated twice at the AWGB International Seminar at Warwick University. 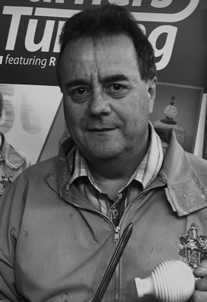 Gary is also on the Register of Professional TurnersGary is considered one of the fastest and most accurate production woodturners in the U.K and is one of only a few whose income comes solely from woodturning. Gary has a customer base of approximately 400, some of these are supplying such places as Harrods and Liberty’s and has also produced work for the homes of the Duke of Westminster and British celebrities. Gary has also produced tools for the woodturner, notably his round skew chisels which come in different sizes, lightpull drive, Box Scraper and his Easybead tool. He can turn his hand to spindle turning, bowl turning, hollow forms and twists and says that he will make anything from a lace bobbin to a billiard table leg. Gary has been asked to teach on numerous occasions by Craft Supplies and has been teaching at Craft Supplies in France past two years. Axminster Power Tools plus many individuals. You can often see him taking a Master Class at various shows and has taught for three days at Axminster but due to the demands of his production business does not always have the time.